1. 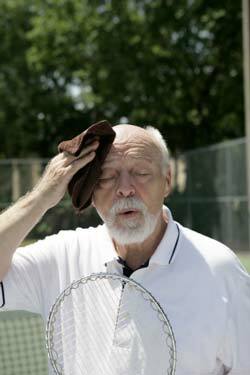 Older adults don't adjust as well as young people to sudden changes in temperature. 2. They are more likely to have a chronic medical condition that changes normal body responses to heat. 3. They are more likely to take prescription medicines that impair the body's ability to regulate its temperature or that inhibit perspiration. The good news is you can follow prevention tips to protect you from heat-related stress. It’s also important to learn the signs and symptoms of heat stroke and heat exhaustion and what to do in case of an emergency.